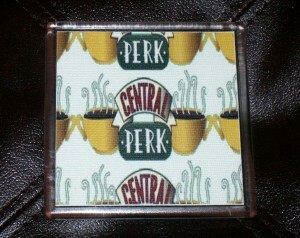 These are coffee cup coasters which has the Central Perk logo as seen on the Friends TV show. A great gift for someone who is obsessed with the TV show AND likes coffee. Did you know there are REAL Central Perk coffee shops in several countries? A Central Perk franchise was started in 2006 which included replica couches and design to look like the Central Perk seen on the TV show.